I wouldn’t think of visiting Maui without a stop in Lahaina. 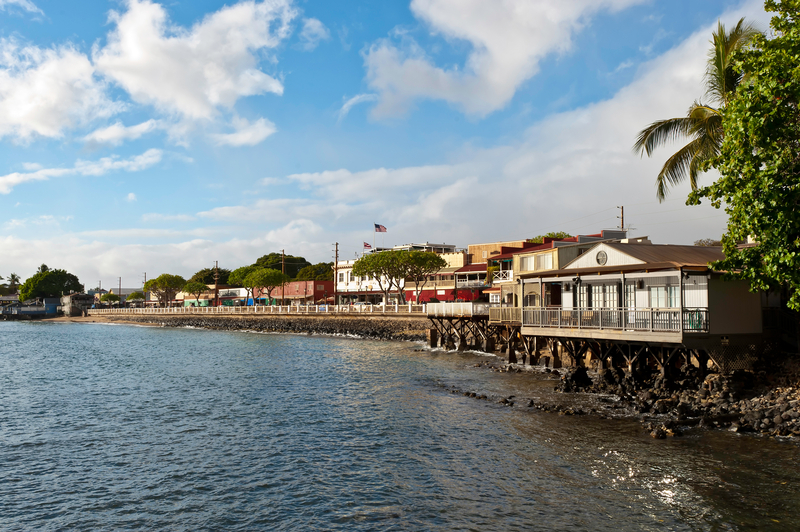 While Lahaina is a highly commercialized city, it still has some of the charm of the old whaling community it used to be. With the harbor, the massive Banyan trees, and the old courthouse, it is just plain fun to visit. The town is long and narrow and runs north and south along the coast. It would be hard to get lost in this town. While you can navigate through town by car, it is more fun to park on the north or south end and walk up and down Front Street. Your stretch of interest is about one mile long. On Front Street, you will find plenty of souvenir shops, eateries, and other people to watch. The town was a whaling capital in the mid-1800s, and many of the old buildings have been preserved and turned into modern shops. Slightly south of the middle of town on Front street is the Banyan Tree Park, which you might think would consist of rows of Banyan trees but it does not. The park has one giant Banyan tree which is 200 feet wide and 60 feet high. It is considered the largest Banyan tree in the United States and well worth a visit. Next to Banyan Tree Park is the old courthouse, which is one of the old buildings converted into a museum. If you are a history buff, make sure and stop in. Also close by is the historic harbor. This is a great place to visit and watch the boats but is an especially fun place to hang out and watch the sun set. If you do enjoy history and don’t get your fill at the old courthouse, you can venture off Front Street and head over to the Whalers Village Museum (2435 Ka’anapali Parkway). You can see whale skeletons and learn all about whaling in Hawaii in previous centuries. This spot is great to keep in mind if the weather is not cooperating. This is one of the few indoor activities you can do with your family if it is raining or if you just plain need a break from the sun. Some of the best luaus in Hawaii can be found in Lahaina: the Old Lahaina and the Feast at Lele. If you want a taste (literally) of good Hawaiian food and culture, take in one of these. See the luau post for more information. If you want a great place for a picnic, look no further than Launiupoko Beach Park. This is a great place to sit back and slowly eat your meal by the seaside. Located on the south end of Lahaina (mile marker 18), it offers great views of Lana`i and Moloka`i. It is also a great place to be whale watching in the middle of winter. 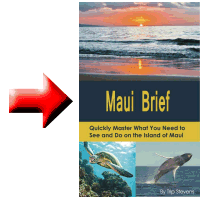 While Lahaina is a great Hawaiian town to visit, the one thing it does not offer that you will find elsewhere on Maui is a vast beach. Unless you are taking your kids to Baby Beach, you will need to postpone all your in-water activities for some day other than the day you visit Lahaina.